Ahafo Regional Minister, Evans Opoku Bobie and some development partners, including World Vision International, Conrad Hilton Foundation, Safe Water Network, the Asutifi North District Assembly and chiefs of Ahafo area, jointly launched a $3.5 million water project on Wednesday. The project, which is expected to be completed by the end of next year, will provide potable water for at least 32,000 people. At a colourful launch of the project at Kenyasi, Robel Lambisso Wamisho, the Technical Programme Manager of the World Vision, who are the financers of the project, said the project targets 56 communities. He said the provision of potable water for communities, schools and health facilities must be prioritised at all times. He said they would also continue to drill boreholes and equip them with hand pumps to serve the communities, adding that the provision of water points from solar–powered mechanised systems and rehabilitation of non-functional boreholes in the district were on course. The Technical Director also said that World Vision's objective of improving sustainable management and governance of water, sanitation and hygiene in the communities is being pursued. To this end, he said the organisation would train people to promote proper sanitation and hygiene for the communities. 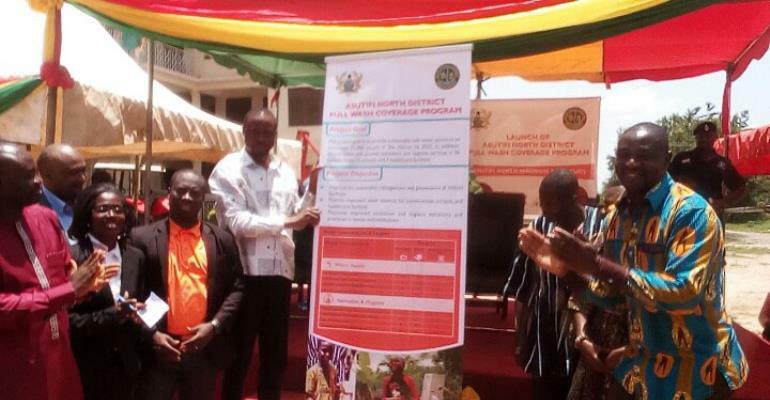 Regional Minister, Evans Opoku Bobie, explained that government will absorb 40% of the cost while donor partners would take 60% and called on beneficiary communities to ensure proper maintenance to sustain the project. Anthony Mensah, District Chief Executive (DCE), for his part, said that the government's effort to make water available to everyone by 2030 is being pursued in line with the Sustainable Development Goals (SDGs) of the United Nations (UN). He bemoaned the frequent breakdown of boreholes due to mismanagement by communities and called on them to inculcate maintenance culture. He said to be able to properly manage and sustain the project after donors, community members are going to pay a token to help repair the facilities. Mr. Mensah said that the assembly, in collaboration with water management teams, will make provision for the very poor in society who cannot pay.